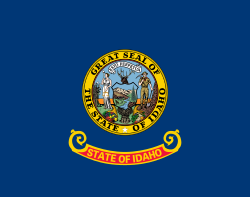 Idaho ( i/ˈaɪdəhoʊ/) is a state in the northwestern region of the United States. Idaho is the 14th largest, the 39th most populous, and the 7th least densely populated of the 50 United States. The estimated population is 1,654,930 and the state has an area of 83,569 square miles (216,440 km2). 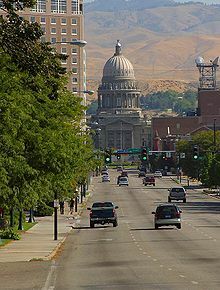 The state's largest city and capital is Boise. Residents are called "Idahoans". Idaho was admitted to the Union on July 3, 1890, as the 43rd state. The exact origin of the name remains a mystery. In the early 1860s, when the United States Congress was considering organizing a new territory in the Rocky Mountains, eccentric lobbyist George M. Willing suggested the name "Idaho", which he claimed was derived from a Shoshone language term meaning "the sun comes from the mountains" or "gem of the mountains". Willing later claimed that he had simply invented the name. Congress ultimately decided to name the area Colorado Territory when it was created in February 1861. Thinking they would get a jump on the name, locals named a community in Colorado "Idaho Springs". Despite this lack of evidence for the origin of the name, many textbooks well into the 20th century repeated as fact Willing's account that the name "Idaho" derived from the Shoshone term "ee-da-how". The name "Idaho" may be derived from the Plains Apache word "ídaahę́", which means "enemy." The Comanches used this word to refer to the Idaho Territory. Idaho borders six US states and one Canadian province. The states of Washington and Oregon are to the west, Nevada and Utah are to the south, and Montana and Wyoming are to the east. Idaho also shares a short border with the Canadian province of British Columbia to the north. 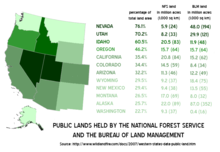 The landscape is rugged with some of the largest unspoiled natural areas in the United States. For example, at 2.3 million acres (930,000 ha), the Frank Church-River of No Return Wilderness Area is the largest contiguous area of protected wilderness in the continental United States. Idaho is a Rocky Mountain state with abundant natural resources and scenic areas. The state has snow-capped mountain ranges, rapids, vast lakes and steep canyons. The waters of the Snake River rush through Hells Canyon, the deepest gorge in the United States. Shoshone Falls plunges down rugged cliffs from a height greater than that of Niagara Falls. The major rivers in Idaho are the Snake River, the Clark Fork/Pend Oreille River, the Clearwater River, and the Salmon River. Other significant rivers include the Coeur d'Alene River, the Spokane River, the Boise River, and the Payette River. The Salmon River empties into the Snake in Hells Canyon and forms the southern boundary of Nez Perce County on its north shore, of which Lewiston is the county seat. The Port of Lewiston, at the confluence of the Clearwater and the Snake Rivers is the farthest inland seaport on the West Coast at 465 river miles from the Pacific at Astoria, Oregon. Idaho has much variation in its climate. Although the state's western border is located about 350 miles (560 km) from the Pacific Ocean, the maritime influence is still felt in Idaho, especially in the winter when cloud cover, humidity, and precipitation are at their maximum extent. This influence has a moderating effect in the winter where temperatures are not as low as would otherwise be expected for a northern state with predominantly high elevations. The maritime influence is least prominent in the eastern part of the state where the precipitation patterns are often reversed, with wetter summers and drier winters, and seasonal temperature differences more extreme, showing a more semi-arid continental climate. Climate in Idaho can be hot, although extended periods over 98 °F (37 °C) for the maximum temperature are rare, except for the lowest point in elevation, Lewiston, which correspondingly sees very little snow. Hot summer days are tempered by the low relative humidity and cooler evenings during summer months since, for most of the state, the highest diurnal difference in temperature is often in the summer. Winters can be cold, although extended periods of bitter cold weather below zero are unusual. This is what led the railroad tycoon Harriman family to develop the famous ski resort, Sun Valley. Idaho's all-time highest temperature of 118 °F (48 °C) was recorded at Orofino on July 28, 1934; the all-time lowest temperature of −60 °F (−51 °C) was recorded at Island Park Dam on January 18, 1943. Redfish Lake in central Idaho. An early presence of French-Canadian trappers is visible in names and toponyms that have survived to this day: Nez Percé, Cœur d'Alène, Boisé, Payette, some preexisting the Lewis and Clark and Astorian expeditions which themselves included significant numbers of French and Métis guides recruited for their familiarity with the terrain. After some tribulation as a territory, including the chaotic transfer of the territorial capital from Lewiston to Boise, disenfranchisement of Mormon polygamists upheld by the U.S. Supreme Court in 1877, and a federal attempt to split the territory between Washington Territory which gained statehood in 1889, a year before Idaho, and the state of Nevada which had been a state since 1864, Idaho achieved statehood in 1890. The economy of the state, which had been primarily supported by metal mining, shifted towards agriculture, forest products and tourism. The Idaho State Historical Society and numerous local historical societies and museums preserve and promote Idaho's cultural heritage. The United States Census Bureau estimates that the population of Idaho was 1,654,930 on July 1, 2015, a 5.57% increase since 2010. 11.2% of Idaho's population was of Hispanic or Latino (they may be of any race). As of 2011, 27.2% of Idaho's children under the age of one belonged to racial or ethnic minority groups, meaning that they had at least one parent who was not non-Hispanic white. Idaho had an estimated population of 1,654,930 in 2015, which was an increase of 20,466, from the prior year and an increase of 87,348, or 5.57%, since 2010. This includes a natural increase since the last census of 58,884 people (that is 111,131 births minus 52,247 deaths) and an increase due to net migration of 75,795 people into the state. 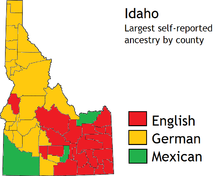 There are large numbers of Americans of English and German ancestry in Idaho. Immigration from outside the United States resulted in a net increase of 14,522 people, and migration within the country produced a net increase of 61,273 people. Nampa, about 20 miles (30 km) west of downtown Boise, became the state's second largest city in the late 1990s, passing Pocatello and Idaho Falls. Nampa's population was under 29, 000 in 1990 and grew to over 81, 000 by 2010. Located between Nampa and Boise, Meridian also experienced high growth, from under 10 000 residents in 1990 to over 75 000 in 2010 and is now Idaho's third largest city. Growth of 5% or more over the same period has also been observed in Caldwell, Coeur d'Alene, Post Falls, and Twin Falls. 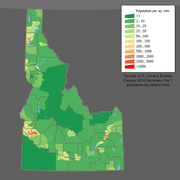 From 1990 to 2010, Idaho's population increased by over 560 000 (55%). The center of population of Idaho is located in Custer County, in the town of Stanley. The largest denominations by number of members in 2010 were The Church of Jesus Christ of Latter-day Saints with 409 265; the Catholic Church with 123 400; the non-denominational Evangelical Protestant with 62 637; and the Assemblies of God with 22 183. Spanish is the second-most-spoken language in Idaho, after English . See also the Native American languages of Idaho. Important industries in Idaho are food processing, lumber and wood products, machinery, chemical products, paper products, electronics manufacturing, silver and other mining, and tourism. The world's largest factory for barrel cheese, the raw product for processed cheese is located in Gooding, Idaho. It has a capacity of 120,000 metric tons per year of barrel cheese and belongs to the Glanbia group. The Idaho National Laboratory (INL) is the largest Department of Energy facility in the country, and one of the most contaminated from years of nuclear weapons related processing and haphazard storage of chemical and radioactive waste. It contains every known type of nuclear waste and receives nearly one billion dollars annually from the DOE budget for cleaning up previous contamination, and managing storage of remaining above ground nuclear waste. INL is an important part of the eastern Idaho economy. Idaho also is home to three facilities of Anheuser-Busch which provide a large part of the malt for breweries located across the nation. Locally, a variety of industries are important. Outdoor recreation is a common example ranging from numerous snowmobile and downhill and cross-country ski areas in winter to the evolution of Lewiston as a retirement community based on mild winters, dry, year-round climate and one of the lowest median wind velocities anywhere, combined with the rivers for a wide variety of activities. Other examples would be ATK Corporation, which operates three ammunition and ammunition components plants in Lewiston. Two are sporting and one is defense contract. The Lewis-Clark valley has an additional independent ammunition components manufacturer and the Chipmunk rifle factory until it was purchased in 2007 by Keystone Sporting Arms and production was moved to Milton, Pennsylvania. Four of the world's six welded aluminum jet boat (for running river rapids) manufacturers are in the Lewiston-Clarkston, WAvalley. Wine grapes were grown between Kendrick and Juliaetta in the Idaho Panhandle by the French Rothschilds until Prohibition. In keeping with this, while there are no large wineries or breweries in Idaho, there are numerous and growing numbers of award winning boutique wineries and microbreweries in the northern part of the state. Today, the largest industry in Idaho is the science and technology sector. It accounts for over 25% of the state's total revenue and over 70% of the state's exports. Idaho's industrial economy is growing, with high-tech products leading the way. Since the late 1970s, Boise has emerged as a center for semiconductor manufacturing. Boise is the home of Micron Technology, the only U.S. manufacturer of dynamic random-access memory (DRAM) chips. Micron at one time manufactured desktop computers, but with very limited success. Hewlett-Packard has operated a large plant in Boise since the 1970s, which is devoted primarily to LaserJet printers production. Clearwater Analytics is another rapidly growing investment accounting and reporting software firm headquartered in Boise, reporting on over $1 trillion in assets. ON Semiconductor, whose worldwide headquarters in Pocatello, is a widely recognized innovator in modern integrated mixed-signal semiconductor products, mixed-signal foundry services, and structured digital products. Coldwater Creek, a women's clothing retailer, is headquartered in Sandpoint. Sun Microsystems (now a part of Oracle Corporation) has two offices in Boise and a parts depot in Pocatello. Sun brings $4 million in annual salaries and over $300 million of revenue to the state each year. The energy landscape of Idaho is favorable to the development of renewable energy systems. The state is rich in renewable energy resources but has limited fossil fuel resources. The Snake River Plain and smaller river basins provide Idaho with some of the best hydroelectric power resources in the nation and its geologically active mountain areas have significant geothermal power and wind power potential. These realities have shaped much of the state's current energy landscape. While Idaho's 515 trillion BTU total energy consumption is low compared with other states and represents just 0.5% of United States consumption, the state also has the nation's 11th smallest population, 1.5 million, so its per capita energy consumption of 352 million Btu is currently just above the national average of 333 million Btu. As the 13th‑largest state in terms of land area (83,570 sq. mi=53,485,000ac), distance creates the additional problem of "line loss". When the length of an electrical transmission line is doubled, the resistance to an electric current passing through it is also doubled. Major airports include the Boise Airport serving the southwest region of Idaho, and the Spokane International Airport (located in Spokane, Washington), which serves northern Idaho. Other airports with scheduled service are the Pullman-Moscow Regional Airport serving the Palouse; the Lewiston-Nez Perce County Airport, serving the Lewis-Clark Valley and north central and west central Idaho; The Magic Valley Regional Airport in Twin Falls; the Idaho Falls Regional Airport; and the Pocatello Regional Airport. Idaho is served by three transcontinental railroads. The Burlington Northern Santa Fe (BNSF) connects the Idaho Panhandle with Seattle, Portland, and Spokane to the west, and Minneapolis and Chicago to the east. The BNSF travels through Kootenai, Bonner, and Boundary counties. The Union Pacific Railroad crosses North Idaho entering from Canada through Boundary and Bonner, and proceeding to Spokane. Canadian Pacific Railway uses Union Pacific Railroad tracks in North Idaho carrying products from Alberta to Spokane and Portland, Oregon. Amtrak's Empire Builder crosses northern Idaho, with its only stop being in Sandpoint. Montana Rail Link also operates between Billings, Montana and Sandpoint, Idaho. The Idaho State Capitol in Boise. All of Idaho's state laws are contained in the Idaho Code. The code is amended through the Legislature with the approval of the governor. 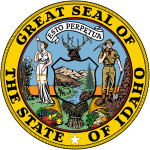 Idaho still operates under its original (1889) state constitution. Since 1946, statewide elected constitutional officers have been elected to four-year terms. They include: Governor, Lieutenant Governor, Secretary of State, Controller (Auditor before 1994), Treasurer, Attorney General, and Superintendent of Public Instruction. Idaho's legislature is part-time. However, the session may be extended if necessary, and often is. Because of this, Idaho's legislators are considered "citizen legislators", meaning that their position as a legislator is not their main occupation. Idaho is divided into political jurisdictions designated as counties. Since 1919 there are 44 counties in the state, ranging in size from 410 to 8 502 square miles (1 062 to 22 020 square kilometers). Since statehood, the Republican Party has usually been the dominant party in Idaho, as there was a polar shift in social and political stance between the two parties, when the Democrats became more liberal and the Republicans more conservative. At one time, Idaho had two Democratic parties, one being the mainstream and the other called the Anti-Mormon Democrats, lasting into the early 20th century. In the 1890s and early 1900s, the Populist Party enjoyed prominence while the Democratic Party maintained a brief dominance in the 1930s during the Great Depression. Since World War II, most statewide elected officials have been Republicans. The last time the Democratic Party held a majority in either house of the state legislature was the House of Representatives in 1958 by one seat. However, Democrats did hold the governorship from 1971 to 1995, despite the state's Republican tilt. Bear Lake viewed from Bear Lake State Park. Idaho has three regional community colleges: North Idaho College in Coeur d'Alene; College of Southern Idaho in Twin Falls; and College of Western Idaho in Nampa, which opened in 2009. A public technical college, Eastern Idaho Technical College, operates in Idaho Falls. Boise is the host to the largest 5 km run for women, the St. Luke's Women's Fitness Celebration. The North America localization of the Yo-Kai Watch franchise takes place in a fictionalized version of Springdale, Idaho.